Hardback. One of the world's greatest unsolved crimes is brought back to life over 100 years later. With insights into life in Victorian London's East End, evidence from the original case and copies of contemporary documents, this compelling book examines the brutal and notorious murders, the victims and the possible motives of the murderer who would become known as Jack the Ripper. 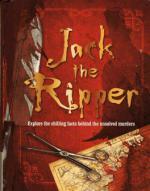 Chapter headings include : Who Was Jack the Ripper? Victorian London, the Murders, The Investigators, The Serial Killer, The Suspects, The Search Continues + Timeline. Profusely Illus. in colour and b/w. 288pp. small 8vo. h/back. Cover design by Charles Wood-Penn. Pictorial covers, dw not required. F.